Croaghaun, a giant slumbering on the western end of Achill Island is not a mountain to be taken lightly. Indeed, everything in this remote part of Ireland seems to be on an epic scale: the cliffs, mountains and views. We parked at Keem Strand above a pristine golden crescent of sand hemmed in by steep cliffs and washed by azure waters, thought to be the location of the artist Paul Henry’s 1910 painting ‘Launching the Currach’. Climbing NW up a steep track to gain the cliff pathway near Carrickfaada, we spotted some violets shyly hiding amid tussocks of grass and the weather beaten shells of several ruined cottages nestled in the valley below, the faint ridges of lazy beds surrounding them speaking eloquently of the industriousness of the inhabitants that once coaxed a living from this land. On the cliff path we turned north and paused to devour our sandwiches on the edge of land tilting steeply upwards like the prow of a battle ship relentlessly pounded by the restless Atlantic into vertiginous cliffs, savouring the smell of the briny breeze and the sound of waves booming into hidden zawns far below. Beyond Moyteoge Head with its abandoned coastguard watch-house lay Clare Island floating somewhere between sea and sky as if in a mirage, the distinctive shape of Knockmore just visible in the haze. 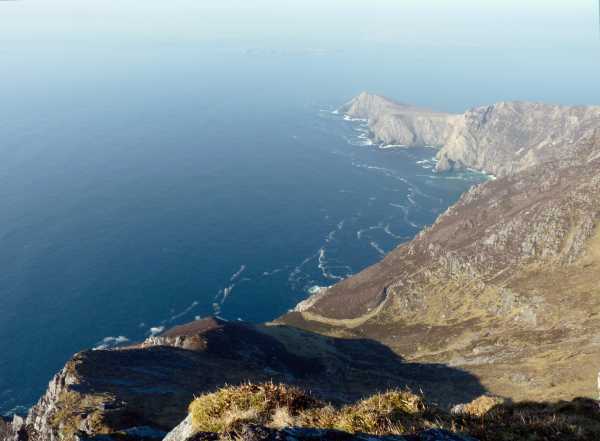 Meandering on the path that rose and fell steeply above Benmore Cliffs we were finally treated to the sight of Achill Head, a crooked finger of land stretching defiantly out into the Atlantic Ocean for over a mile, ending with the sea stacks Gaoí Saggart and Carrickakin. At F54624 05171 B we descended north of two lakes crossing the bog at the valley bottom to climb the steep stone and heather clad eastern slopes of Croaghaun. In the mid-afternoon heat and high humidity this proved to be an ordeal enlivened only by the fascinating geology of Dalradian quartzites and schists formed around 600 million years ago, many rocks sporting amazing patterns left behind by myriad lichens in shades of ochre, beige and burnt sienna. Walking over rocks resembling a decorative pathway studded with quartz pebbles that are 2 billion years old, swept down in an ancient deluge onto a floodplain from a mountain range in the former continent of Laurentia, gently reminds one of the fleetingness of human life when set against the immensity of geological time.